Want to learn ways to prepare for a job interview? Need free job interview tips? Want practical job searching help? You've come to the right place! 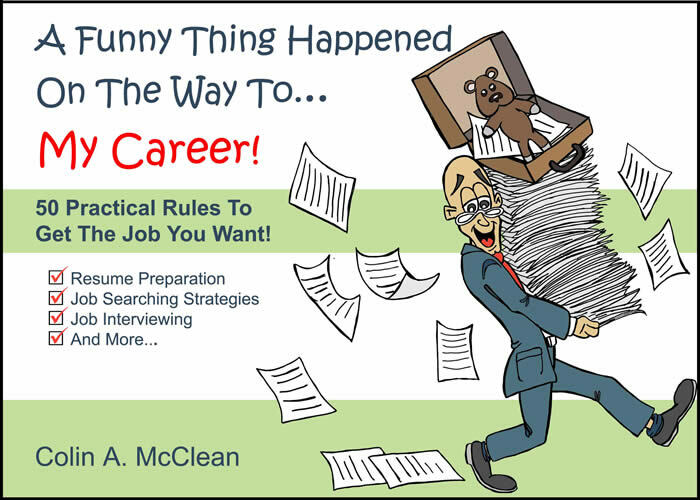 "What NOT to do in an Interview"
If you are new to job searching or if you haven't had to look for work recently, you'll find the practical rules on resume preparation, job searching strategies and job interviewing found in the short paperback A Funny Thing Happened On The Way To... My Career! give you the skills and confidence to tackle this particular life challenge like a pro. Or visit Amazon.com to download the E-BOOK version of A Funny Thing Happened On The Way To ... My Career! Get your e-book copy so you can take these essential job searching rules with you on your iPad, iPhone, iPod touch, Kindle, PC, Mac, Blackberry, and Android-based devices. On this site you'll learn ways to prepare for a job interview by following the Free Job Interview Tips. You can download a list of Common Interview Questions, view Resume Templates or sign up for a Resume Writing E-Course by dynamic career coach Cecile Peterkin. Catch up on job searching news and information in Articles. Don't forget to take advantage of new offers on the Products & Services page where information and entertainment combine to prepare you for your next career adventure!